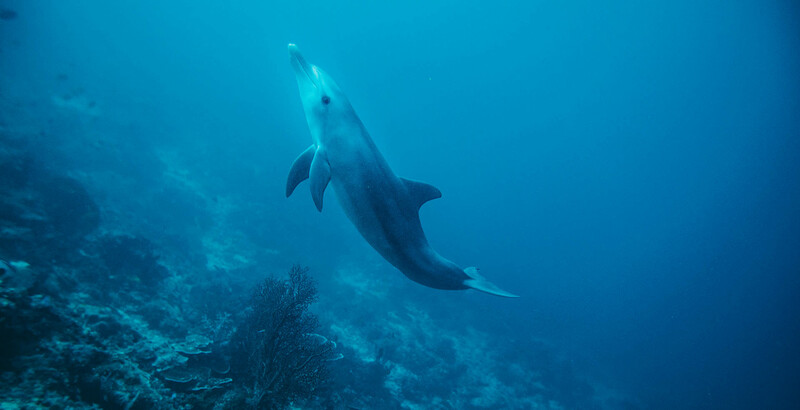 I never expected to see a dolphin underwater while scuba diving. I have seen them many times at the surface, playing in the wake of boats in the Philippines and Indonesia, but as soon as you might try to get into the water with them, they disappear into the blue. We were diving a seamount that is often a cleaning stating for passing mantas, the plan was to drop immediately to 25 meters and wait for the mantas to show up. I was a little slower than the others in our group because I was checking my camera settings before going too deep. As I dropped to about 12 meters, I saw a flash of white, and then the outline of something really big in the water below me. Had no idea what it was, but as I descended, the unmistakeable shape of the dolphin appeared. Trying to remain calm, I controlled my breathing, attempting to not scare it away with the bubbles. Swimming closer, the dolphin came over to check me out before continuing towards the surface to hunt fish. Just over a small sea ridge, I could see two more dolphins hanging out. As they swam away, I checked the replay on my camera, not believing that it really happened. Check out the gallery below to see the photo highlights, or see the all the photo galleries from our Raja Ampat liveaboard dive trip – from scuba diving, to aerial photos, to freediving, to the incredible wildlife and local people living in this amazing place. You can also see galleries from other Seven Seas liveaboard dive trips – my absolute favorite way to explore the awesome natural beauty and unique cultures of Indonesia. I never expected to see a dolphin underwater while scuba diving. I have seen them many times at the surface, playing in the wake of boats in the Philippines and Indonesia, but as soon as you might try to get into the water with them, they disappear into the blue.We were diving a seamount that is often a cleaning stating for passing mantas, the plan was to drop immediately to 25 meters and wait for the mantas to show up. I was a little slower than the others in our group because I was checking my camera settings before going too deep.As I dropped to about 12 meters, I saw a flash of white, and then the outline of something really big in the water below me. Had no idea what it was, but as I descended, the unmistakeable shape of the dolphin appeared.